When encountering the familiar in an unfamiliar context, how does one act and “be” as a researcher? My current research is about live music entertainment in themed leisure venues in Asia, and the overseas Filipino musicians who predominate the transnational labor force for this performance sector. Although playing live music professionally is typically classified as part of creative/cultural industries, the economic contexts of tourism, leisure, and hospitality configure this labor as service employment—that is, a form of interactive entertainment adding ambience and liveliness to places like theme parks, hotels, and cruise ships. My thesis explores how and why Filipino musicians are racially constructed and branded as “perfect” for this line of migrant creative work. I had some important things in common with my respondents: like them, I am an overseas Filipino and a musician, albeit a non-professional one. While my primary motive in initiating conversation was to solicit interviews for research, I am also personally invested in issues that mattered to many of them: the regard for entertainment (musical or otherwise) as a serious line of work in need of better recognition and understanding; the complex relationship between one’s racial/national identification and one’s identity as a musician; and the ways in which living overseas transformed that connection—how being a migrant distinctly shaped the sense of music-making as a Filipino. In many cases, framing my interview requests through this shared subjectivity was a reliable way of establishing an instant, friendly rapport. Many were pleased to find a kapwa Pinoy—an informal Tagalog phrase meaning “fellow Filipino”—in the audience. Indeed, not only were my requests for interviews gamely accepted: I also found myself the embarrassed recipient of unexpected offers of free food and drink, song dedications, and many times just a vague outpouring of courteous solicitude. This may also have had to do with the fact that I was a single Filipina traveling Asia and going out at night on her own. Culturally, this signaled an impulse among my kapwa Pinoys to provide company and protection. This attentiveness was magnified during the four-day cruise I took from Penang, Malaysia to the Thai islands of Krabi and Phuket where I was, quite conspicuously, the only solo traveler in a boat full of 800 passengers (all families and couples). On the first day of the cruise I “outed” myself as a kapwa Pinoy and researcher to the chief guest relations officer, who immediately took me under his wing. Throughout the cruise, as I hung out at the ship’s lobby with a cup of hazelnut coffee to listen to the Filipino pianist and guitar trio, he would stop by to proffer observations about the musicians’ work arrangements and experiences with passengers, recommend sights to see during the on-shore excursions, and share confidences about the perks and woes of living on a ship ten months of the year. On the last evening, during the guests’ traditional gala dinner with the ship’s officers, he made sure to save me a place at the head table, right beside the Swedish staff captain. “Ask him all the questions you want,” he urged. “He’s your best source of info.” He was right: I ended up getting one of my most illuminating interviews about the particularities of cruise ship work. On the one hand, it was clear that this generosity was prompted by my respondents’ simple appreciation of my presence as a kapwa Pinoy interested in and supportive of their efforts to lead productive lives as migrant workers abroad. Yet it was hard not to think that this behavior was part of their job to guarantee positive feedback by making me feel welcome—treating me as a guest and not just a consumer—by performing the labor of entertainment in an otherwise impersonal and unremarkable consumer transaction. Moreover, once we had established that an interview was to take place, our interaction took on the tenor of a third sort of performance: that of a researcher and interview subject dancing the fluid narrative line between what I wanted to hear and what they wanted to say. This triple positionality as kapwa Pinoy, paying guest, and researcher meant that the space of encounter I created with my respondents was intimate yet ephemeral, shifting constantly between reserve and candor, professional distance and informal proximity. Again, being on a cruise amplified this simultaneous feeling of affinity and difference. While the cruise I joined was over 700 feet long, I was surprised that after just a day onboard, crew members already began to recognize passengers by face if not by name. At the end of the cruise, I felt a palpable reluctance to say goodbye to that guest relations officer and all the other Filipino musicians and cruise workers who had so cheerfully watched out for me—and indeed, kept me company—during those four days. How do we make full and good use of this figurative (sometimes literal) space of the same boat? Is one’s way of being as a researcher to be judged only by the quality and amount of data collected, or also by the degree to which the encounter was made meaningful to respondents, something worth their while? I have found that the most data-rich and enriching experiences on the field are the ones where my own positionalities blurred and merged. In this space of listening, it became possible for me and my respondents to speak through and beyond our compartmentalized ways of being, giving way to other stories, even other selves. I once made a comment to a kapwa graduate student about how my respondents warmed up to me once they had seen that I stayed and listened until their last sets. He replied, “Of course they like it! They’re performers! They want people to listen to them.” Professional attention-seeking notwithstanding, I became acutely aware of how, in fieldwork as in “real” life, the act of listening is a radical privilege and responsibility. While asking respondents to tell their stories may ultimately serve the interest of the research project, I learned that simply being willing to listen can become its own form of service. 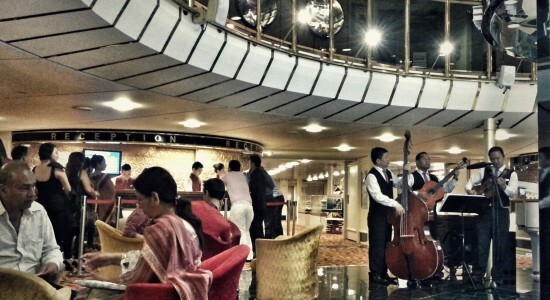 Image: An all-Filipino acoustic guitar trio serenades passengers at the lobby lounge of a cruise ship traveling from Malaysia to Thailand. Photograph by author.